Ruben Hernandez studied Music Education & Percussion Performance at San Diego State University under the guidance of Greg Cohen (Percussion – San Diego Symphony), Mike Holguin (Drum-Set), and Afro-Latin percussion with Mark Lamson and John Flood. His work as a classical player has allowed him to perform alongside well-known composers, conductors, players and orchestras, including: Gustavo Dudamel, Orquesta de Baja California, Eduardo Diaz-Muñoz, Matthew Rowe, Eduardo Garcia Barrios, Armando Pesqueira, Michael Daugherty, Steven Bryant, Dimitri Dudin, Catalin Rotaru, Horacio Franco, Tijuana Opera, Opera Ambulante, Tijuana Camerata, and several others. 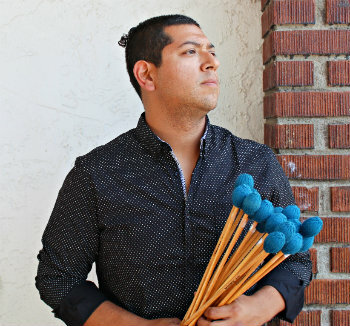 Outside classical music, Ruben's work as percussionist includes a variety of ensembles, from Mexican Folk-Music, to Rock, Jazz, Flamenco, and more. He is currently a member of “Malan-DRO” a Prog-Rock Fusion Ensemble, and a Folk-Rock-Klezmer band named “La Ballena de Jonas”. He also serves as a guest performer for the Baja California Orchestra, Tijuana Camerata, and for “Madame Ur y sus Hombres” (Jazzy Trip-Hop). Ruben teaches percussion and drums at the San Diego Youth Symphony, The OPUS Community Project, the Tijuana Youth Symphony, The San Diego Unified District, and The Carlsbad School District. He has formed part of the International Teaching Faculty as the Percussion Instructor for the National Take a Stand Festival in 2016 (Aspen & Bard), 2017 (Los Angeles) and 2018 (Los Angeles). He also serves as the Director of “Percusiones de las Californias” a percussion institution that serves the Tijuana and San Diego communities with lessons, clinics, master-classes, community drum-circles and an annual percussion festival in Tijuana, Mexico. Ruben Hernandez proudly uses: Dream Cymbals, Innovative Percussion, Grover Pro Percussion, and REMO.